I don’t know if it’s a seasonal thing but now that it’s colder I seem to be spending more of my time knitting than sewing. It could be related to a recent sewing disaster but more on that in another post. 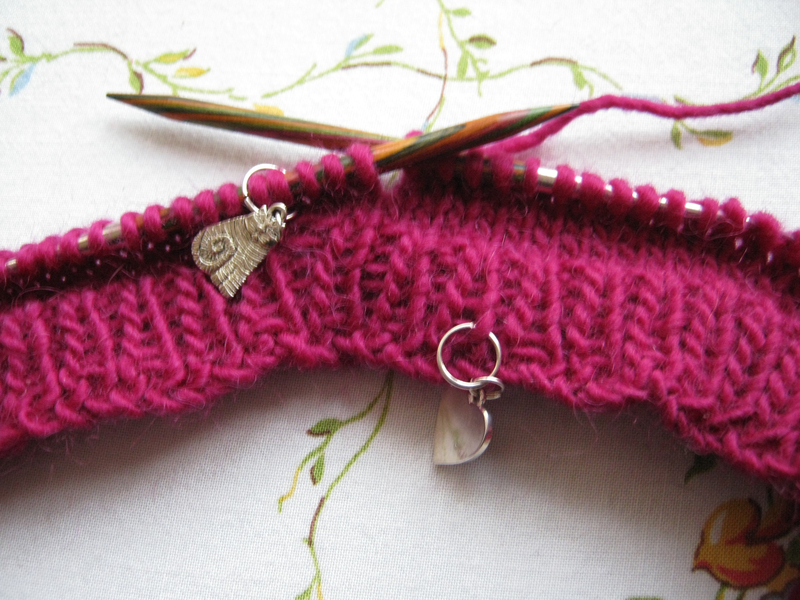 Current knitting WIPS are Rose Red by Ysolda and She’s Electric by Ann Weaver. I had intended for She’s Electric to be my Xmas project and I was going to knit as much of it as I could, possibly even finish it, over the Xmas holidays. It didn’t work out that way. It’s not photographed that well this time in my 11 rows picture. It’s a lot more vibrant in real life and the old pic is more true to its colour. I could have knit a lot more on this than I have as asides from checking which way your increases are going, it’s mostly stocking stitch. 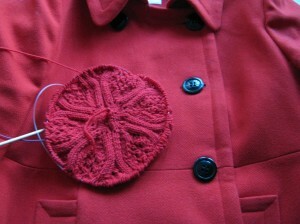 But I bought a red coat in the sales and decided that it was time to pluck the two balls of Debbie Bliss Rialto DK in colour 23012 out of my stash and cast on for a much promised Rose Red beret by Ysolda. It doesn’t quite match my coat – the coat is more of an orangey red and the yarn is more of a blue red – but they’ll go together fine. I’m currently wearing the coat with a scarf from Rowan Biggy Print that I made I-can’t-remember-how-long-ago but I want to make a cowl to go with the coat. I have some yarn in my stash for that but am not sure how long it’ll be before I cast on for that since I have to finish RR first! I’ve had so many problems with RR though. It’s no fault of the pattern which is very well written, alas it’s all down to me. 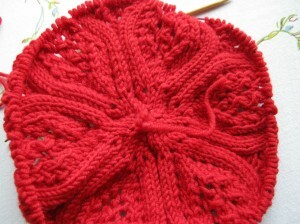 I have to really focus when knitting it and count my stitches every row. So far I’ve had to rip out lots of rows and in one case rip it right back to the icord start, because I’d made a mistake. I love the way the design is building, it’s gorgeous. It’s just that this isn’t tv watching knitting, at least not for me. And it’s certainly not something I can work on while watching Borgen and keep up with the subtitles! SE is perfectly suited for that but I just haven’t been picking up the needles. Something else that can take away from crafting time is reading. Since last year I’ve really got back into it with a passion. I love Good Reads and their book reading challenge is great. This year I’ve set myself the target of reading 30 books. That’s mainly because a lot of the books I’ve been reading have been quite long and whereas I can easily whiz my way through 300 pages, it’s a bit harder when it’s over 700. I’ve just finished This Perfect day by Ira Levin which had a really big impact on me, I’ll be thinking about it for a while. My MRI came back clear which means that I haven’t damaged any of the soft tissue in my left hip. I’ve been having physiotherapy since November as all of the slowing down recommended by the GP has meant that my muscles had become very weak. They’re building up more now and I’ve been able to go back to my pilates classes. The impingements haven’t gone away of course, and there will still be things that I can’t do like some movements in pilates. I don’t know when I’ll have to have surgery on them, probably not for a few years anyway, but I’m seeing the surgeon again next week for the MRI follow up.